The December 15, 2017 deadline for large employers and small employers in certain “high hazard industries” to submit injury and illness data to OSHA is less than a month away. We have been tracking closely the Trump Administration’s treatment of OSHA’s new E-Recordkeeping and Anti-Retaliation Rule, and while there have been plenty of signals that this rule is due for an overhaul, or even possibly to be rescinded, it appears that the initial data submission deadline of December 15th is going to stand. 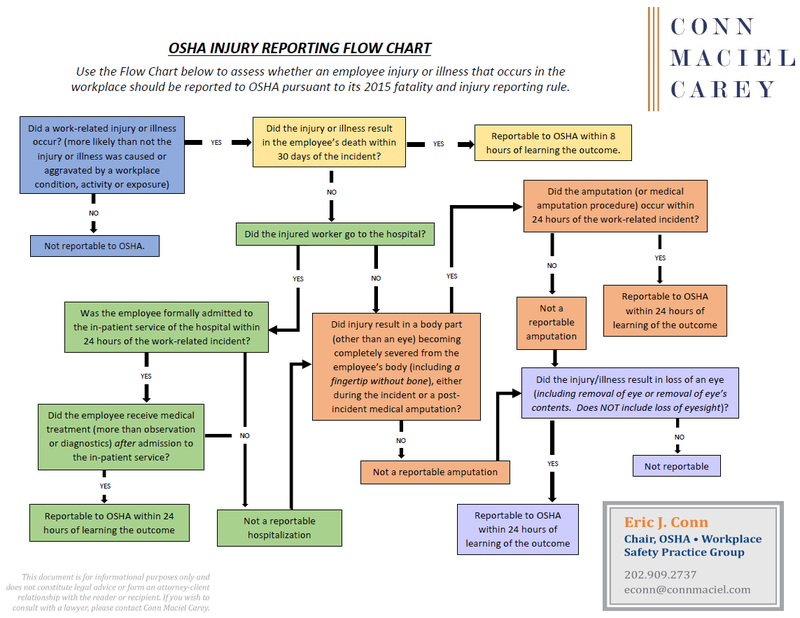 Therefore, if employers have not already done so, they should immediately evaluate whether the rule applies to any or all of their workplaces, get familiar with and set up an account in OSHA’s Injury Tracking Application (the portal that will receive the injury data), and submit covered injury data (i.e., their 2016 OSHA 300A Annual Summary data) by December 15, 2017. After months of rumors and speculation, this morning, October 30, 2017, the White House finally announced its choice for the role of Assistant Secretary of Labor for OSHA. I am personally very pleased that nomination was Scott A. Mugno. Scott has been a friend and professional associate for many years, and I believe his diverse background puts him in a unique position to be a dynamic and successful leader at OSHA. In his current job, Scott is a Corporate Safety Director. Previous to his FedEx Ground position, Scott was the Corporate Safety Director at FedEx Express in Memphis. Prior to that, he had been a practicing regulatory attorney for both private employers and law firms. Before that, he spent six years serving our nation as an attorney in the Army JAG corps. The combination of all of these past experiences puts Scott in a unique position to successfully execute OSHA’s safety mission. OSHA whistleblower complaints have been on the rise, and the Equal Employment Opportunity Commission receives more charges of retaliation than any other type of claim for the statutes they regulate, including Title VII discrimination. Employers’ perceptions about their legal responsibilities for certain workers is not always reality. Although an employer may classify workers as temporary workers or independent contractors, that does not mean the Department of Labor takes the same view. At the tail end of the Obama Administration, DOL was vocal about its belief that most workers should be treated as employees, insinuating that in most cases, employers will be accountable for the specific obligations of an employer-employee relationship. The Trump Administration is moving in the other direction, but a lot of questions remain unanswered or muddled. DOL has also been cracking down on employee misclassification and division of responsibility among multiple employers. Additionally, employers continue to have certain safety and health related obligations and potential OSHA liability depending on their role at multi-employer worksites or in joint employer situations. In May 2017, Eric J. Conn sat down with Leona Lewis, Founder of ComplyEthic, to discuss the regulatory landscape at OSHA as we transition from Obama to Trump, and what employers should do to successfully navigate the new regulatory landscape, for a new segment on ComplyEthic’s terrific Podcast – “Masters of Disaster.” Here is a link to the interview on the podcast. The Podcast segment was entitled “OSHA Regulation Under Trump Administration; What Companies Can Do,” and featured discussion about the differences in priority and approach between Obama’s and Trump’s OSHA, new regulatory strategies that may be available to employers, and what steps employers should take to prepare for and manage the new regulatory environment. On March 28, 2017, Eric J. Conn and Dan C. Deacon of Conn Maciel Carey’s national OSHA Practice Group presented a webinar regarding OSHA’s old “Standards Improvement Project” and Pres. Trump’s new Executive Orders to Slash Regulations. OSHA initiated a “Standards Improvement Project” (SIP) under the Clinton Admin. to make non-controversial changes to confusing, outdated or duplicative OSHA standards. There have been a series of SIP rulemakings since, culminating in SIP Phase IV, published by Obama’s OSHA late in 2016, which proposes numerous revisions to existing standards, including a change to OSHA’s Lockout/Tagout (LOTO) standard that is hardly non-controversial. Specifically, OSHA is attempting to use SIP to undo a judicial interpretation of “unexpected energization” that OSHA does not support; reading “unexpected” right out of the standard. What Trump’s OSHA does with the LOTO proposal specifically is a mystery, but what is more important is Trump’s recent actions to address the “regulatory state,” which appear to put SIP on steroids. Trump has long stated that over-regulation is hampering America’s economic growth, and plans for decreasing regulations have been a high priority in his 100-day action plan. Trump and Congressional Republicans have made heavy use of the obscure “Congressional Review Act” to permanently repeal numerous Obama-era regulations. The President has also signed a “2-for-1” Executive Order that requires federal agencies to cut two existing regulations for every new regulation they implement, and another Executive Order directing federal agencies to create “regulatory reform” Task Forces to evaluate federal rules and recommend whether to keep, repeal or change them. Trump intends for these task forces to reduce what it deems expensive or unnecessary rules. OSHA rules may be on the chopping block. Washington Legal Foundation just published Eric J. Conn’s “Legal Opinion Letter” article regarding OSHA’s new “Volks Rule” attempting to circumvent the D.C. Circuit ruling limiting OSHA’s statute of limitations for injury and illness recordkeeping violations from 5½ years to six months. Below is a summary of the article with an update about Congressional action scrutinizing the Rule, and here is a link to the full article. In the waning days of the Obama Administration, OSHA promulgated a new rule purportedly “clarifying” employers’ continuing duty to correct injury and illness recordkeeping logs for the entire five-year period the logs must be kept. See 81 Fed. Reg. 91,792 (Dec. 19, 2016). The final rule, dubbed the “Clarification of Employer’s Continuing Obligation to Make and Maintain an Accurate Record of Each Recordable Injury and Illness,” amended OSHA’s existing recordkeeping regulations in order to circumvent a 2012 decision of the United States Court of Appeals for the District of Columbia in AKM LLC v. Secretary of Labor (Volks II), 675 F.3d 752 (DC Cir. 2012). This “clarifying” rule is unlawful and should be repudiated. OSHA’s Injury and Illness Recordkeeping regulations require employers to record certain injuries and illnesses within seven days of the incident and also to preserve a copy of those records for five years. 29 C.F.R. Part 1904 et seq. Separately, the Occupational Safety and Health Act of 1970 (OSH Act) authorizes the Secretary of Labor to issue citations alleging violations of regulations adopted under the Act. 29 U.S.C. §§ 651-678. The statute of limitations in the OSH Act states, however, that “[n]o citation may be issued under this section after the expiration of six months following the occurrence of any violation.” 29 U.S.C. § 658(c). President Trump originally chose Andrew Puzder, the CEO of CKE Holdings, the parent company of Carl’s Jr. and Hardee’s, as his nominee for Secretary of Labor. However, on February 15, 2017, one day prior to his much-delayed confirmation hearing, Mr. Puzder withdrew his name from consideration amidst reports that he would not receive the required Senate votes necessary for confirmation. Mr. Puzder’s nomination was knocked off track by allegations that he failed to pay workers overtime pay, hired an undocumented worker in his home, condoned sexual harassment, and opposed legislative efforts to address those problems. The next day, President Trump officially tapped former U.S. Attorney Alex Acosta for the position. If confirmed as Labor Secretary, Mr. Acosta will oversee the federal apparatus that investigates violations of minimum wage, overtime and workplace safety laws and regulations. Mr. Acosta would also be the first Hispanic member of President Trump’s cabinet. On January 25th, attorneys from Conn Maciel Carey’s national OSHA Practice Group presented a webinar regarding OSHA’s 2016 in Review and the Top 5 OSHA Issues to Track in 2017. The ball has dropped, the confetti has been swept out of Times Square, and 2016 (and the Obama Administration) is in the books. It is time to look back at the year and take stock of what we learned from and about OSHA over the past year. More importantly, the question on everyone’s mind (well, maybe just ours), is what can we expect from OSHA in the first year of the Trump Administration? This webinar event reviewed OSHA enforcement, rulemaking and other developments from 2016, and forecast the Top 5 OSHA Issues employers should monitor and prepare for in the New Year and the new Administration. As a parting gift from Joe Main, the departing Assistant Secretary of Labor for the Mine Safety & Health Administration (MSHA), MSHA released this week the final rule for Examinations of Working Places in Metal and Nonmetal Mines. MSHA first proposed rebooting 30 C.F.R. §56/57.18002 on June 8, 2016. After an extended public comment period, ending on September 30, 2016, MSHA modified elements of the proposed rule while crafting the final version which will be formally published in the Federal Register next Monday, January 23, 2017. The effective date, when MSHA will begin enforcement of the new provisions within the final rule, is May 23, 2017 or 120 days following publication on January 23rd. Until the effective date, the existing provisions of §56/57.18002 will remain the standard for enforcement purposes. Under the current standard mine operators must perform a workplace examination at least once per shift, maintain a record for twelve (12) months which must include the name of the examiner, locations of areas examined and the date. Make records available to MSHA inspectors AND miner representatives, providing copies upon request. OSHA has long enforced sanitation and accessibility standards for restrooms for workers – an idea that generally makes sense viewed as a health concern. In the last few years, however, new policies at the state and federal levels on transgender issues mean all employers must pay particular attention to rules and enforcement regarding access to restrooms. The emergence of bathroom issues from a legal and regulatory standpoint is not limited to the controversial transgender issue. This article addresses the complexities of this subject and how it affects regulatory compliance and employment law liabilities. ensuring the workplace bathroom is maintained in a sanitary condition. On December 13, 2016, Eric J. Conn and Jordan Schwartz of Conn Maciel Carey’s national Labor and Employment and OSHA Practices, for a complimentary webinar regarding Employee Access to Sanitary Bathrooms, ADA Accessibility, and Transgender Bathrooms. Although not historically a hotbed of OSHA / Employment law activity, access to bathrooms by both employees and members of the public has become a high profile issue of late. OSHA has always required employers to provide employees with prompt access to sanitary toilet facilities, to minimize adverse health risks. Recently, however, OSHA and other federal, state and local authorities began to prohibit discriminatory practices with regard to restroom access based on the principle that individuals have the right to use facilities consistent with their gender identity. There are also a host of requirements under the Americans with Disabilities Act that must be met for a bathroom to be considered accessible and usable by an individual with a disability. This webinar reviewed the requirements in these areas, and provided specific strategies to address this new and complex area of the law. By Law the Anti-Retaliation Provisions of OSHA’s New Electronic Recordkeeping Rule Become Effective December 1st — Tomorrow! On November 28, 2016, the federal district court Judge in the Northern District of Texas hearing Industry’s legal challenge to the anti-retaliation portions of OSHA’s new electronic recordkeeping rule (i.e., limits on injury reporting requirements, post-incident drug testing, and safety incentive programs), issued an Order denying Industry’s motion for a preliminary injunction that would have prohibited OSHA from enforcing these controversial new provisions. The Court’s Order clears the way for the new provisions to become effective and enforceable as of December 1, 2016. Accordingly, it is not only prudent but perhaps imperative that employers immediately evaluate their safety incentive programs; drug testing programs; management bonus compensation schemes; and injury reporting policies to determine whether they comport with the new rule. OSHA’s new electronic injury recordkeeping rule includes anti-retaliation provisions that create new employer obligations and prohibitions related to internal employee injury reporting procedures, and expands OSHA’s enforcement authority by introducing a vague new set of anti-retaliation provisions. Particularly controversial is the impact of OSHA’s new rule on employers’ policies for post-injury drug testing, safety incentive programs, and executive compensation and bonuses. Until very recently, employers have seen little guidance about what OSHA means by reasonable reporting procedures or what types of policies may violate the new anti-retaliation provisions. On October 19, 2016, OSHA issued a Guidance Memorandum offering its interpretation of the vague, controversial anti-retaliation provisions of OSHA’s new electronic injury and illness recordkeeping rule. The timing of OSHA’s issuance of the October Guidance is particularly noteworthy, given developments in the legal challenge filed by Industry plaintiffs in a federal district court in Texas (TEXO ABC/AGC, Inc., et al. v. Perez, Civil Action No. 3:16-cv-01998-D), which we have described in previous articles. Specifically, just one week before issuing the Guidance Memo, OSHA deferred the enforcement effective date of the anti-retaliation provisions, for the second time, from November 1st to December 1st. This second delay of the anti-retaliation rule was done at the specific request of the Texas judge overseeing the case, who is considering industry’s request for a Preliminary Injunction. The Guidance is not unexpected. Amidst growing frustration from Industry about the rule and its lack of clarity, OSHA promised last summer when it decided to first postpone the enforcement date from August 1, 2016 to November 1, 2016, to publish guidance explaining the new provisions. Indeed, OSHA’s defense against Industry’s motion for a preliminary injunction against the rule is that there is no way Industry can show irreparable harm from the new rule because there was no way for employers to know what the rule actually prohibits and requires. Texas District Court Enjoins the Administration from Enforcing the Federal Government Contractor “Blacklisting” Provisions of the Federal Acquisition Regulatory Council’s New Final “Fair Pay and Safe Workplaces” Rule. On August 25, 2016, the Obama Administration, through the Federal Acquisition Regulatory (FAR) Council and in conjunction with the U.S. Department of Labor, promulgated the final Fair Pay and Safe Workplaces regulation and parallel guidance from the Labor Department, which collectively federal contractors have unaffectionately dubbed the “Blacklisting Rule.” The cornerstone provisions of the final rule establish expansive new reporting obligations for contractors bidding on executive branch contracts with an estimated value exceeding $500,000. These contractors, along with subcontractors whose portions of the overall contract meet the $500,000 threshold contract value, must disclose all confirmed and alleged violations issued under 14 labor laws, including alleged OSHA citations, within the three years prior to a prospective contractor’s bid submission, regardless of the status of the citation or whether the citation has yet been upheld in a judicial or administrative review process afforded employers. To be clear, under the final rule, all OSHA citations must be reported, even minor paperwork citations characterized as “OTS” (“other-than-serious”). The final rule change the manner in which the rule applies to subcontractors. Unlike the proposed rule, the final rule requires covered subcontractors to disclose violations directly to the Department of Labor, which will conduct a “responsibility determination” and return it to the subcontractor, who in turn will then be required to deliver it to the prime contractor. The final rule also pushed back the mandatory disclosure date for subcontractors to October 25, 2017, a year after the disclosure requirements were set to begin for prime contractors. The disclosure requirements for all contractors apply equally to related state labor laws, which sweeps in all citations issued under the 27 federal OSHA-approved state OSH programs administered by state occupational safety and health agencies such as CAL/OSHA. Whichever contractor is awarded a covered contract must also disclose any old and new OSHA or other alleged labor law violation (referred to in the regulation as “administrative merits determinations”) during regular, bi-annual reports throughout the life of the contract.